My principal camera is a Nikon D7000 (~$1300) which I am quite happy with. There’s a review at byThom that was instrumental in my decision to buy it. Why Nikon? Primarily because of good marketing on their part. I used an old Nikon rangefinder in a high school photography class that a local dealer had donated. I always saw the Nikon logo on cameras in the photos on stories about photojournalists (and I saw the ‘Bridges of Madison County’). So when I thought camera, I thought Nikon. Why DX? Because when I bought my D70 I was replacing the Minolta Maxxum 7000 that I finally managed to destroy. I was looking for something good, but not in the FX price range. I never planned to make any money from photography and thought spending 5 to 10 grand on equipment would be foolish. I didn’t know I was going to get so involved with this stuff. Now I’m heavily invested in Nikon DX bodies, lenses and strobes, and couldn’t begin to think about switching to another brand or format. I still don’t make that much money from photography. My go-to lens is an AF-S Zoom-Nikkor ED 18-200mm f/3.5-5.6G IF DX VR (~$850) which is nearly always mounted to the D7000. 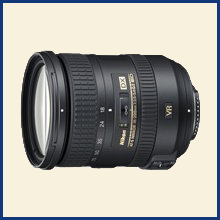 There’s an extensive review of this lens at Ken Rockwell’s site. I use a Nikkor 50mm f/1.4G AF-S (~$440) for portrait and near distance, low light work. When I want a compact zoom for Street Photography I use my Nikkor 18-70mm f/3.5 kit lens that came with my D70. It gives some flexibility in composition but is less obtrusive than the 18-200mm. 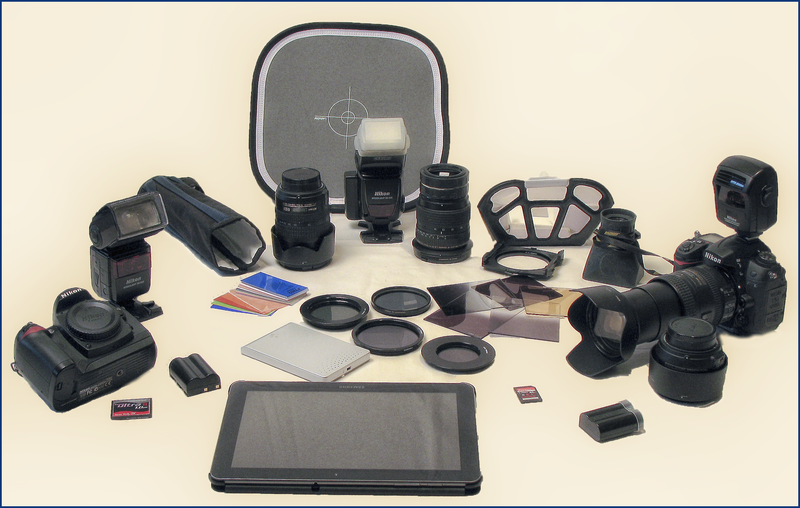 The last lens I use is a Tamron (ProMaster) 11-18mm/f4. I purchased this for use in real estate photography but have since found my Nikkor 18-200mm is perfectly adequate at 18mm for interior room work plus it has better optics. I seldom use BTL filters, but I have B+W CPLs, Cokin ND Gradients at 1, 2 and 3 stops, and a Cokin Solid ND8 3 stop for long exposures (flowing water, e.g.). The camera has a tripod mount with a foldable D-ring for clipping to my BlackRapid RS4 shoulder strap and mounting plates to fasten to my tripod and ball head. Off camera strobes include a Nikon SB600 and a SB800. I can place these nearly anywhere and control them with my Speedlight Commander SU800 (~$250). I can position the Speedlights on the floor or counter top or use fold-up light stands. I also carry a Manfrotto Justin Clamp (~$50) if I need to mount a light in an odd place, like the top of a door. I use a LumiQuest 80-20 bounce/diffuser, a Roque FlashBender reflector/snoot, and various gels to modify the light from my strobes. Along with backup batteries for both cameras, a bunch of AA batteries for the strobes, extra memory cards (CompactFlash for the D70, SD for the D7000), rain covers, loupes, lens brushes and cloths, etc, it all fits in my Tamrac Pro 12 bag. Fully loaded it weighs about 22 pounds. I sometimes pack a few items in a Tamrac Velocity 8X sling pack for short hikes. In a 12″ x 28″ duffle bag I carry 2 portable light stands, umbrellas, diffusers, reflectors, gaffers tape, assorted clips, clamps and bungee cords, etc. All this is primarily for interior real estate work. I use Adobe Lightroom 5.7 to import, catalog, RAW process, print and web publish my photos. Final processing is done in Adobe Photoshop CS6 with plugins from Photomatix Pro 4.1 (HDR), the complete NIK Software suite and several Topaz Labs filters. Recently, I’ve started using Portrait Professional for portrait work. 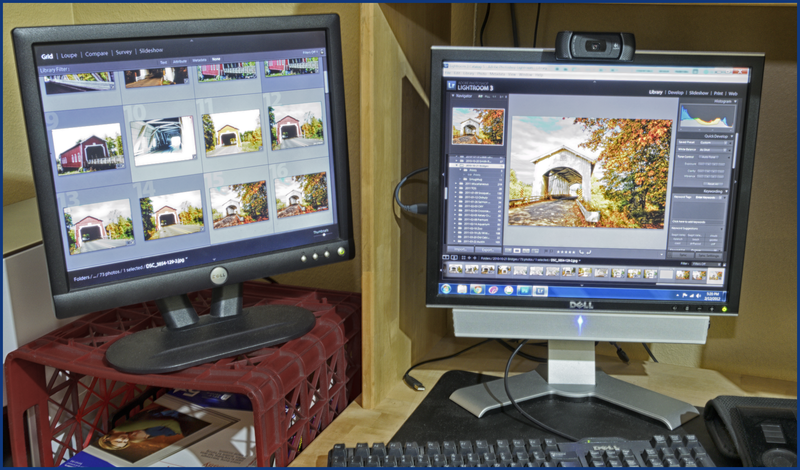 In the studio I use Nikon Camera Control Pro for tethering my cameras to my PC. 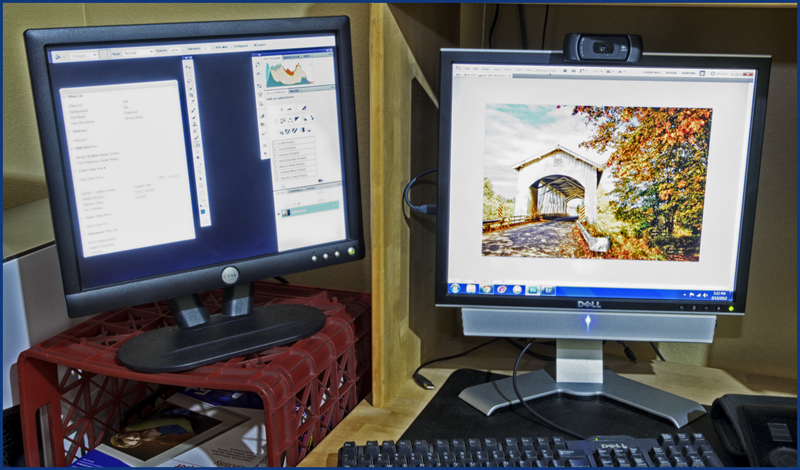 With it I can instantly see what I’ve captured on my PC’s large monitor and make exposure adjustments right from the keyboard if necessary. In my “photo lab”, I use an X-Rite Monitor Calibrator to keep my LCD colors correct. They don’t make or support this one anymore and I really ought to get a new one. For my own purposes I print 8x10s on an Epson Stylus Photo R380 Printer (6 cartridge Claria inks) using Red River papers. I’m a big fan of the luster finishes.